Elegantly understated, the 6' Gardenfall Clear Glass and Brushed Stainless Steel Floor Fountain with LED Lights combines stainless steel with clear glass to achieve a look that's clean, contemporary, and sophisticated. Featuring a new LED Color Light Display System with 15 pre-programmed light display combinations, you can also select from several solid color choices, or make your own, to add a mesmerizing glow to the flowing water as it flows down on one side of the clear glass into a bed of polished river rocks. All it takes is a touch of a button or a slide of a finger on the included remote control. 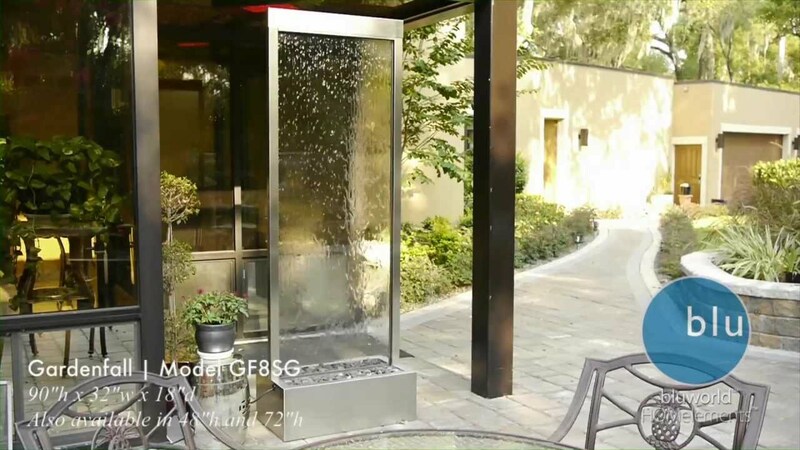 Tested for all kinds of weather, this fountain can also be placed in your yard or garden with its basin buried into a flower bed to make it appear as though the water is flowing down into the flowers. Remarkable on its own, this fountain, which installs in as little as 30 minutes, can also be embellished with a logo so you can have that subtle detail that will give you an edge over your competitors.